Light means rigged but not animated character in 3D MAX 2009. There are no Character Studio BIP animation clips in the pack as well. But animated FBX file is included. Eva with all armors and weapons: 21,845 polygons, 43,162 triangles and 23,269 vertexes. 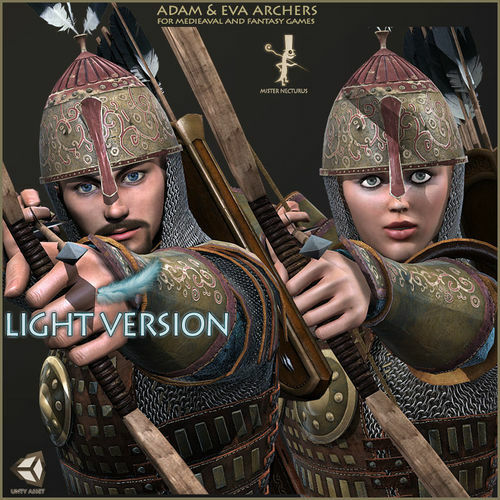 Adam with all armors and weapons: 21,596 polygons, 42,714 triangles and 23,122 vertexes. 112 Animation for warrior,archer combats and general moves. 96 on place animations. And 26 animations with root motion data used by Unity Mecanim. (for each character) Eva Rig has 72 bones. Adam Rig has 70 bones. There are very high detailed textures. diffuse, specular, opacity and normals maps. TIF file format 4096x4096, 2048X2048, 1024X1024. Original 3D MAX file with rigged character in T-pose included. (for each character) 2 Body textures (naked and with underclothes) included. (for each character) 4 Eva Hairs textures included. 2 hairs and beard (Adam) styles included 5 Adam Hairs textures included. FBX files included.